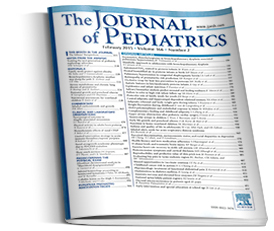 The Journal of Pediatrics is an international peer-reviewed journal that advances pediatric research and serves as a practical guide for pediatricians who manage health and diagnose and treat disorders in infants, children, and adolescents. The Journal publishes original work based on standards of excellence and expert review. The Journal seeks to publish high quality original articles that are immediately applicable to practice (basic science, translational research, evidence-based medicine), brief clinical and laboratory case reports, medical progress, expert commentary, grand rounds, insightful editorials, “classic” physical examinations, and novel insights into clinical and academic pediatric medicine related to every aspect of child health. Published monthly since 1932, The Journal of Pediatrics continues to promote the latest developments in pediatric medicine, child health, policy, and advocacy. It is ranked 6th out of 117 journals in the Pediatrics category in the 2014 Journal Science Report, Thomson Reuters with 2013 Impact Factor of 3.736.